Who wants to fill up my coffee? Well, the first month is done. It’s been a whirlwind of a month. Getting to know the students and teachers and constantly changing schedules takes a lot out of you. I’m tired, I need a lot more coffee, but I enjoy the classroom teacher position. It’s nice to just focus on just one class and on just fourteen students as opposed to six classes and over a hundred students like I had last year at the same school. It’s also been a bit of a make-shift beginning of the year, because as per usual here the books came very late and some did not come at all. So, I’ve had to make do with the resources that I have at the school and online resources. For English resources, I have an endless supply because the office has to have thousands of books. I photocopy what I need for the day or week and that’s that. For the other subjects though such as social sciences and math, I’ve had to work a bit harder. Pinterest is a teacher’s best friend for sure; it not only offers crafting ideas, but there are also lesson plans, worksheets, and pretty much anything I could ever need. Teachers are very creative people are love to share with one another. Another great resource that I’m utilizing more is education.com which has some amazing workbooks that go over exactly what we’re doing in our classes. Learning about place value? There’s a workbook for that. Learning about the world, maps, and directions? There’s a workbook for that. Trying to teach about rhymes and sentence structure? There are books for that as well. Absolutely wonderful resource. There are also some games and videos on the site that I need to look through that could be very useful. I’ve found some interactive math sites which are also amazing for my children because they can’t understand everything that I am saying so having something that they can touch and visualize helps immensely. Behaviorally, of course, there are a few problems, but there will always be problems especially in a school and culture where any sort of discipline / consequence is frowned upon. Even setting up simple routines can be hard to do because of this. Take for example morning reading hour, when the students are supposed to come into the room, put their stuff away, pick out a book, and read silently until breakfast time. Every day we go over the routine, we ask and we tell the children to please get a book, stop fooling around, stop talking, and please read. It doesn’t matter which language it is said in, they have yet to once be able to do this successfully. Then, when all the children actually are quiet and reading, another student comes into the room and the talking starts again. It’s not like we don’t give the children time to talk. We give them plenty of time to talk. Breakfast time is free reign and they can talk as much as they’d like. Their break times between each lesson they are allowed to talk, play, run around, dance, and do pretty much whatever their little hearts want to do.It is something that my co-teacher and I will have to talk about again because I think reading hour is actually very important building both their Turkish skills and their English comprehension. Parent-Teacher meeting is next Sunday I believe, and if the parents ask, I will tell. I do not and have never sugarcoated things and lied to the parents. Ask and you shall receive 🙂 Some may get angry, but the truth is the truth. If the child does not respect his or her friends or teachers, how do you think that they will act when they grow up? I do as much as I can to teach manners and respect in the classroom, but there is only so much a teacher can do. The rest is up to the parents at home because they are their children’s first and forever teachers. I’m not saying all of my children are disrespectful, I’m just saying this as a general statement. For the most part, the children pay attention and love to participate, though, I do have to encourage some more than others to participate or pay attention. I involve them all and try to be fair to all. I try to liven things up a bit and do some activities because I understand that 2nd grade isn’t easy for them. Now that they finally know how to read and write, the workload is harder and more intense. English especially is hard right now too because it’s time to focus on proper pronunciations and spelling. They get away easy in Turkish because Turkish is a very phonetic language and what they hear is how it is spelled. As we all know, English is not like that at all. So, yes, there is a lot of writing this year in English which I know the children tire of after some time. This is when I try to liven things up a bit with activities or songs or dances or even simple fill in the blanks where they don’t realize that they’re practicing their spelling or sentence structuring. On the subject of gateway activities, my students love to dance. I’m surprised because my class is made of mostly boys, but when the music comes on or the dance video come up the boys are actually in the front row and the first to dance. They’ve certainly got some moves (and a huge surplus of energy that I wish they’d transfer to me)! All in all, though, I got lucky this year. I have the smallest class in the school, I have students whose English comprehension is pretty decent, I have a wonderful co-teacher who I love, and I have parents who are very involved. I could be in the position of others at the school which would not be fun.There has been a lot of chaos this year in the English department and, well, everywhere else. I won’t go into detail here though. Perhaps at a later date. I just have to think positive thoughts for now. Author Una VagabondaPosted on 2 November, 15 Categories education, elementary education, esl, ib pyp, Istanbul, school, teacher, teaching, TurkeyTags arel koleji, child, children, class, education, efl, English, esl, school, students, teacher, teaching, teaching in turkey, Turkey, İstanbulLeave a comment on Who wants to fill up my coffee? The new school year is nearly upon us teachers over here in Turkey. We’re starting a bit later, September 28th, because of how a certain religious holiday falls this year. Though the students get some extra vacation time, we teachers still must come to school. We have meetings and such, most of which are in Turkish so it is hard for us native English teachers to attend. Some teachers are also teaching some summer English classes which I had to do last year, but now that I am a classroom teacher, I do not have to. 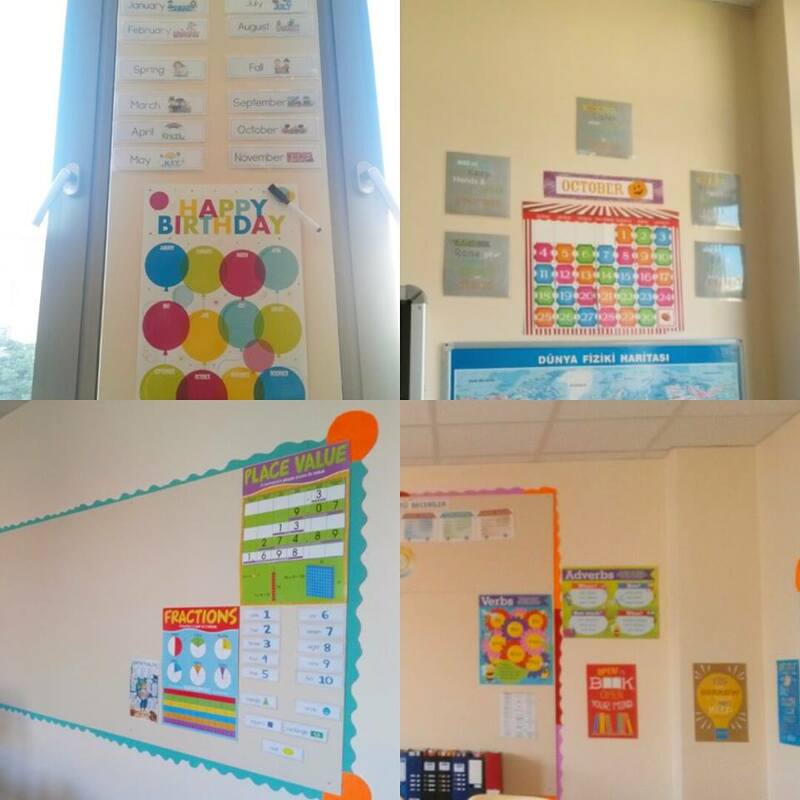 I’m currently busy decorating my classroom and will continue to do so until the school year starts. I should actually say my shared classroom, since I will have a co-teacher. I’ve met her, and though her English is very little, she seems very nice and I think we’ll get along just fine. I just need to learn how to share. I have to keep in mind that it is not just my classroom; it is our classroom and we both should have an equal share of the space (and the responsibilities!). I don’t want there to be any tension this year. She’s taking English classes apparently, but I’m sure we’ll teach one another more than a class ever could. I have most of my decorations up, now it’s time to help her put up some of hers. We are excited to start the year and get to know our students. We’re finally starting to figure out what the first units are that we will be teaching, so I want to start to plan accordingly. As I work at an IB PYP school, I have to plan a certain way. I do like the IB way of thinking, so it should be interesting. This year might be a bit more intense because our school is being evaluated. Our first unit for 2nd grade is, ‘Where We Are in Place and Time’ so it’ll be a bit of a geography unit and history unit. Both things I very much enjoy. Central Idea: Various factors contribute to change within communities over time. It will definitely be interesting to co-plan lessons with my co-teacher. We’ll have to learn things like how to divide some of the lessons or if we want to do a lesson together, etc. This is a bit of a difficult topic to explain to young learners, especially in a language that isn’t their first. I will definitely need the full cooperation of my co-teacher. Though I am sure there will be quite a few challenges this year, I think it will be fun and also very educating for the both of us. I’m hoping for a wonderful school year with a wonderful class. I will have about fourteen students… eleven of which will be boys and only three girls. It’ll be interesting to say the least, but I plan on having fun. I know and will admit that the situation in Turkey isn’t the best financially or the safest, but I am in an area that is away from many of the things that are going on. I’ll try to keep this blog more up to date to let everyone know what is going on. For now, though my financial situation is absolutely horrible because of the exchange rate, I’m safe and in good hands. I’ll update more as the year unfolds! I’ve recently made a TeachersPayTeachers (TpT) account (click here) and I would love if my fellow teachers would take a gander and follow me through there. Some products are free and most are low-cost! I’ll be updating frequently throughout the year as I create more products. I’ll be teaching a 2nd grade PYP ELL classroom, so I should have a multitude of products most being at the elementary level being uploaded as the year goes on. Message me if you have any requests! Let’s help one another out! Thank you, and I will update soon! The school year is about to start and I am super excited!